Korma is one of the nation's favourite curries. Wonderfully mild, it is perfect for kids or people who don't like their curries too hot. 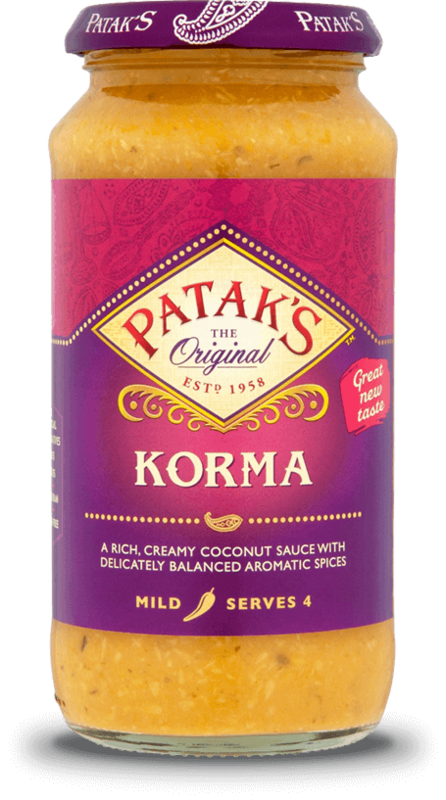 Patak's Korma is a deliciously creamy sauce with desiccated coconut and a delicately balanced blend of authentic spices with ginger and coriander. A real family favourite, our Korma is one of our most popular curry sauces. A Kofta is essentially a Middle Eastern or Asian version of the meatball - but of course distinctive by the addition of a wonderful blend of spices. I love this recipe as it tempers the spices of the kofka with a lovely, mild coconut sauce. Great if you have a jar of Patak's Korma sauce in the cupboard and fancy something a bit different than well, your usual Korma. Korma is one of our most popular curries, and it is not surprising when you taste the wonderful, creamy blend of coconut and authentic spices. It is so comforting and indulgent. This dish uses our new Easy Korma for 2 Spice Paste, which makes is incredibly simple to create an authentic tasting Korma. The Spice Paste blends the wonderful, delicate spices such as paprika, corinader and ginger, with coconut, meaning all you need to add is chicken, cream a bit of water, and an onion.